5. 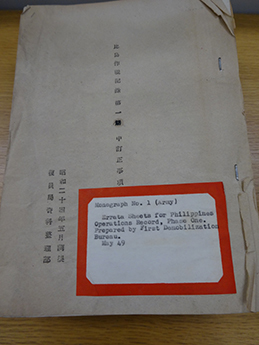 Information on Related Document Holdings　"The Condition of Japan Related Materials in the United Kingdom"
Do you know that the Japanese Army and Navy carried out disaster relief activities before the Second World War? Much like today’s Self-Defense Force, the Japanese Army and Navy once performed relief, guard, and rescue activities. Although they didn’t have a conduct code stating their duties in times of disaster, the Institution sought to protect people's lives and property. At first disaster relief was comprised of unofficial activities. Such activities are described in documents from our database on efforts following an earthquake that occurred on July15th,1896 (Reference Code:C07071033600) [Image 1]. Sendai was devastated by the earthquake, and by coincidence Second Division Commanding Officer Nogi Maresuke was stationed in the city. He requested the Army Ministry to send army surgeons and corpsman. The request was refused by Army Vice Minister Kodama Gentaro, who argued that even if temporary relief activities are carried out from a moral viewpoint, it is still unreasonable for the Minister of the Army to pay expenses for activities that should be supervised by the Ministry of Home Affairs. So while relief activities were not officially made part of the army’s duty, its importance was recognized and the relationship between guarding Japan and disaster relief started to be clear. The Japanese Army and Navy came to assist many in 1914 when the largest volcano eruption of the twentieth century occurred in Sakurajima, Japan. There are official documents for exploration in the JACAR archives that give insight into what happened. For practice, one can try an image search for "Sakurajima eruption"(Reference Code:C08020510900) [Image 2]. When you wish to use more than one keyword, you can enter multiple keywords in the search box. Currently, eight search results will appear. Select conditions with the "Show" and "Hide" buttons. You can also filter search results by document types for photographs in your search. If you use the sample term of "Sakurajima eruption" you will find (Reference Code:C02031780800) [Image 4]. 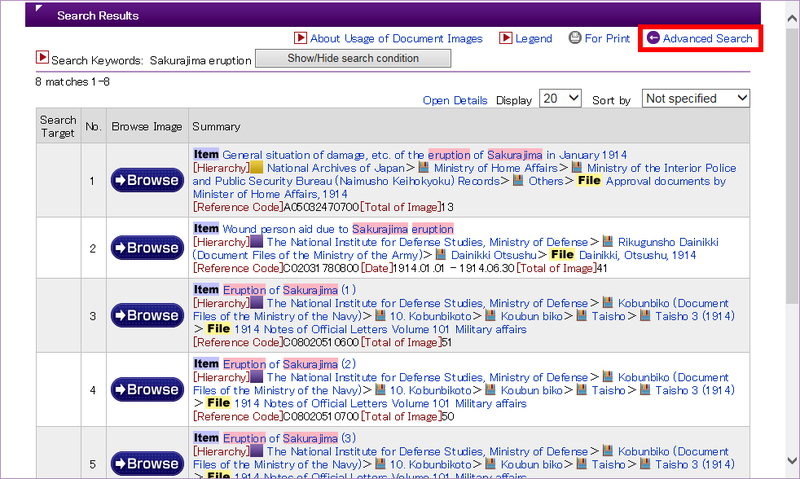 The title "Eruption of Sakurajima" currently appears sixth in the search result list and it is the most detailed report concerning the disaster in our database. 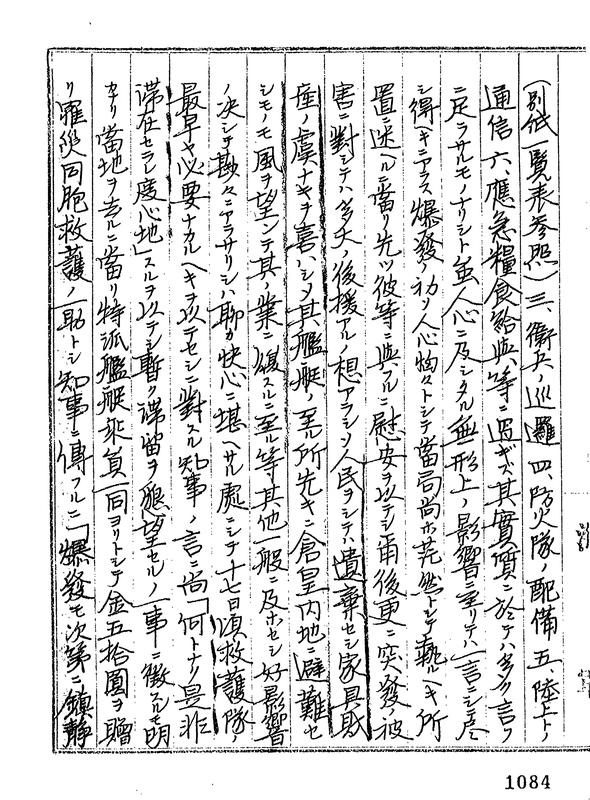 Since there are many pages, the records are divided into six items (Reference Code：C08020510600-C08020511100), including telegram records, reports of the inner Japanese Navy, reports on implementation drawn up by a prefectural governor, and records of the Secretary of the Interior. There is information on the disaster site and correspondence between many organizations, which it is worth going over below. The Japanese Navy sent medical treatments with a cruiser as well as a destroyer that collected information and carried out relief efforts. Thankfully, the Sakurajima eruption did not injure many people and though their work was small in scale, the Japanese Imperial Army presence in the disaster area increased feelings of security. The army carried out early guard and relief activities at a very high level in cooperation with police and firefighters as supervised by governor of Kagoshima prefecture (Reference Code:C02031780800) [Image 5]. According to a duplicated report that appears to have been submitted by a chief aide de camp to Emperor (recorded in "Sakurajima taisho funka shi’), baseless rumors resulted in chaos and robberies near the eruption. Records show that the army arrested four thieves and 130 peoples on charges of larceny. From such records, we can also learn that the army fed and transported displaced persons to hospitals and elsewhere. The records serve as evidence suggesting the army was engaged in relief efforts while also guarding the Japanese people. Such efforts deepened connections between victims in disaster regions and army personnel. The records also suggest that the army managed to mobilize and help citizens at times when police, firefighters and the Red Cross Society could not. In this way the army of the past may have set a precedent for today’s Self-Defense Force to achieve historical feats. Sakurajima taishō funka hyakusyunen kinenshi, Kagosima Ken, 2015. 1914 Sakurajima Funka Hōkokusyo, Naikakufu cyuō Bousai Kaigi, 2012. 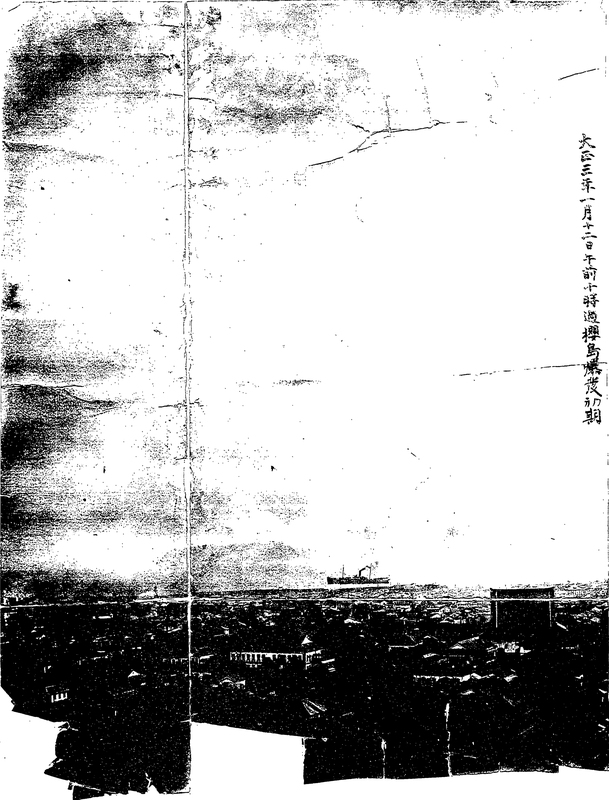 Sakurajima taishō funka Shi, Kagoshimaken,1929. Ishihara Kazuhiro, "Sakurajima no funka dai ikkai 20 seiki saidai no Sakurajima taishō funka to sono kyō kun",NHK(Japan Brodcasting Corporation), August 9, 2014 update. 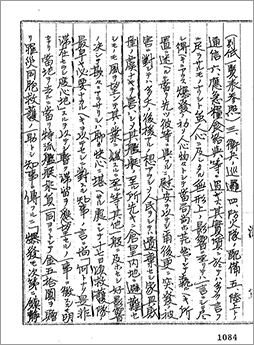 Yoshida Ritstuto, "Guntai no 'Saigai Syutsudō' seido no Kakuritsu", printed in Journal Shigaku Zasshi, Vol.117. no.10, 2009. Documents include the orders of battle to follow imperial commands having been administered by the Imperial Headquarters Army Department. The orders were issued between the second Sino-Japanese War until the Pacific War. 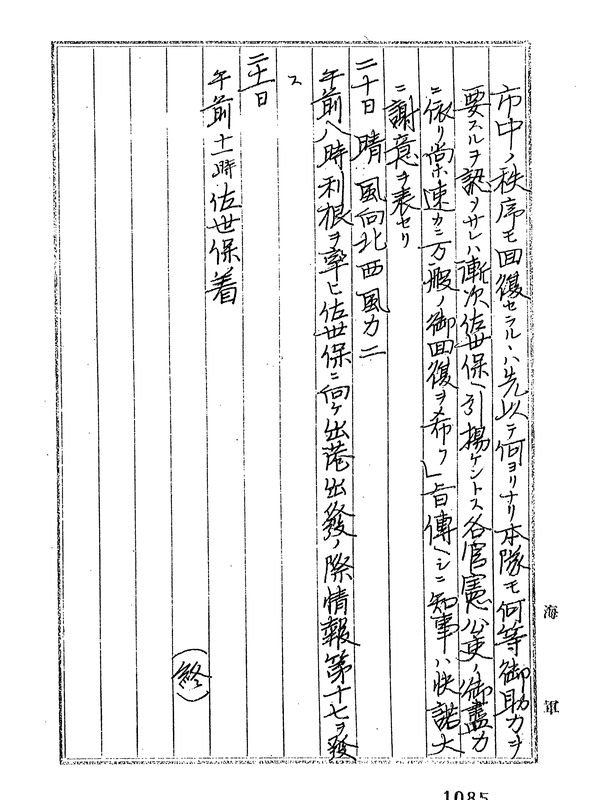 The documents show detailed information on the movement of units abroad [see Army Records (Rid of Dainikki)> Chuo (General)> Butai Rekisi (Units History)> Zenpan(General)]. These documents were compiled with logistic survey reports and contain information on Japanese military rations. The series includes documents describing outlines and histories of many military regiments compiled by themselves. This series consists of detailed battle reports on Malay operations that began December 8th 1941. Dating after the operation, there is also detailed information on the simultaneous occupation of Singapore and the Java operation. Some documents were created by the defense headquarters in Palembang for Sumatra operations and there are items related to demobilization after the Pacific War as well. This series includes battle reports of the Combined Fleet during the Sino-Japanese War of 1894-1895. This series consists of battle reports, documents related to the Combined Fleet and the track chart of Baltic Fleet during the Russo-Japanese War. This series includes records of war between Japan and Germany, the World War 1. This series includes detailed battle reports and war diaries of Shanghai Special Landing Party in the Shanghai Incident of 1932 as well as the operation records of navy detachment served at Songhuajiang after the Manchurian Incident of 1931. This series includes records of stationed troops in northern French Indochina during July of 1940. There are also duty reports of the 5th Destroyer Squadron and from the warship "Nagara," which had been positioned near Saigon (now renamed Ho Chi Minh City). 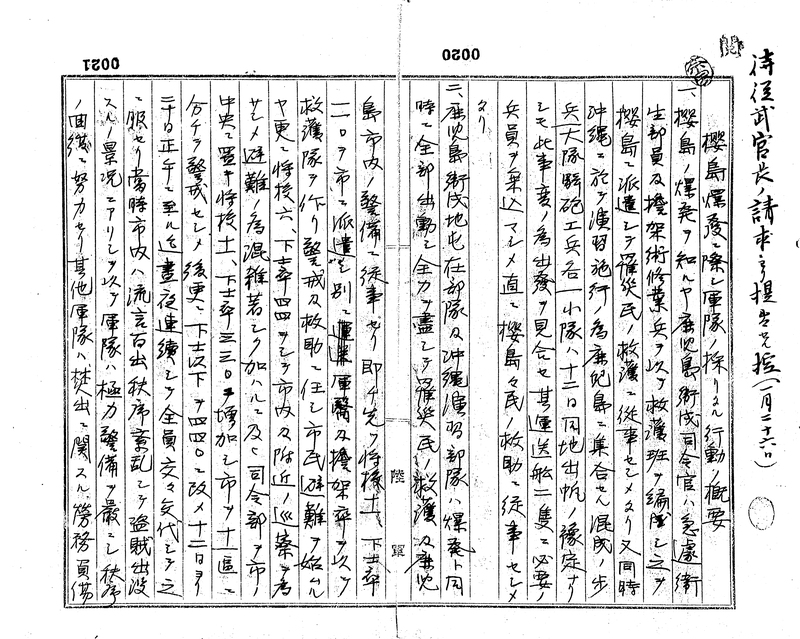 Additionally, records are included relating to the stationing of troops of warship "Hiryu". 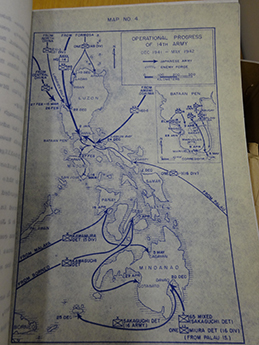 This series includes operation records of the Department of Naval Aeronautics during Second Sino-Japanese War as well as detailed battle reports of air force units and battle records of Special Landing Parties. This series includes documents created by Hankou branch office of the First Naval Store Department, Nanjing Naval guards, and Hainan Minor Naval Station, etc. These were related to activities of Imperial Japanese Navy in China. This series includes records of the Aleutian operation and records of North Pacific aerial warfare. There are also documents related to various affairs after the World War 2 on Manchuria, Korea, Karafuto (Sakhalin) and Chishima (Kurile). 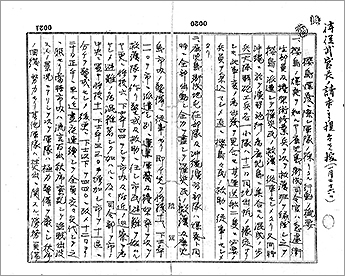 Imperial Japanese Naval General Staff Office related records on national defense policies and military plans from 1920-1944. This series consists of records related to the transfer of weapons kept by the Japanese Army as well as records of Japanese soldiers being demobilized outside of Japan. Materials are also included that relate to military history and responses to demands of the Allied Forces’ General Headquarters (GHQ). 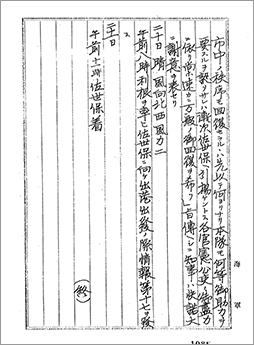 There are reports written by the Central Liaison Office which negotiated with the GHQ, records of informative matters created by End-of-War Administration Liaison Committee, and also records of the Liaison Committee (Arisue Kikan), which was established to correspond to the GHQ after being organized by Arisue Seizo, a former Lieutenant General who had also served as General Staff Office chief of the 2nd department. Documents from "Category 1: Government Organization" have recently been released. 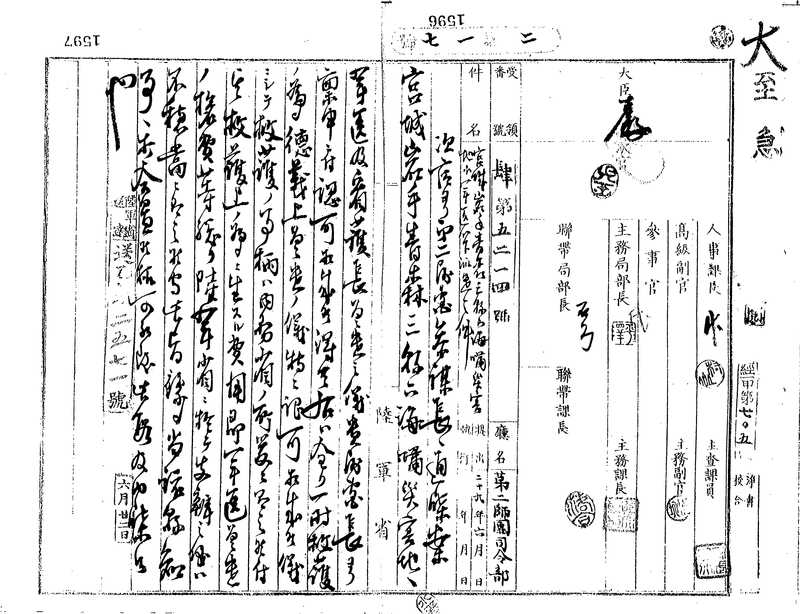 They include items in "Section 1: Government Organization of Japan" such as documents relating to the organization of colonies such as Korea and Taiwan, and those relating to the organization of the newly established government agencies such as the Ministry of Colonial Affairs and the Ministry of Greater East Asia. "Section 2: Organization and Inner Regulations of the Ministry of Foreign Affairs" consists of documents relating to the organization and establishment of departments and bureaus as well as their inner regulations, such as ministerial ordinances and instructions. "Section 3: Japanese Diplomatic Establishments Abroad" includes documents relating to establishment, relocation, and closure of embassies and consulates abroad. "Section 4: Non-Japanese Government Organizations" includes documents relating to government organizations of foreign countries. "Section 5: Non-Japanese Embassies and Consulates Based Outside of Japan" includes documents relating to foreign embassies and consulates established in China, the USSR, and other places. Documents of the latter part of "Category 2: Government Post" have recently been released. "Section 0" includes items relating to Japanese staff members transferred from other government agencies to embassies and consulates abroad. "Section 1: Appointment and Dismissal, Rewards and Punishments, Pension, Miscellaneous" includes personnel affairs documents. "Section 2: Work Related Travel Abroad, Inspection of Multiple Sites" includes documents and reports relating to directives and administrative procedures for official trips by ministry staff. Our archive is housed in Kanagawa Prefecture, which also contains the second largest constellation of American military bases in Japan — the largest being in Okinawa. As in Okinawa, Kanagawa’s military installation has had a great influence on the life of those living nearby. The naval district that appeared in Yokosuka during the Meiji era gave rise to a city around it, contributing to urbanization. With an increase in the population came problems for citizens, such as noises that continue today from loud machines including military planes of the Atsugi camp. In this exhibition titled "Kanagawa’s Military Bases and local communities", we explored how locales had lived with military installations from the Meiji era to our present day. In the exhibition, pictured below, we focused on the establishment of military bases as well as human life in the area of Kanagawa. The prefecture is well-known for its naval district in Yokosuka as well as for its former Japanese military academy in Sagamihara. In our search for information on Kanagawa’s military development, historical records provided by JACAR have proven to be very helpful. Currently Sagamihara serves as a sort of military city that contains the former site of the Imperial Japanese Army Academy, which moved into the area in 1937. The original site of the military academy was Ichigaya, Tokyo, but Tokyo’s density made it difficult to use the area for military training exercises. For this reason the Japanese military selected a new site in 1936, a process about which information can be found in the file "New Location and Construction of Imperial Japanese Military Academy" (within "Mitsu Dainikki 1936", which is held by the Ministry of Defense’s National Institute for Defense Studies). Papers discuss how the military site came to be selected for military training. 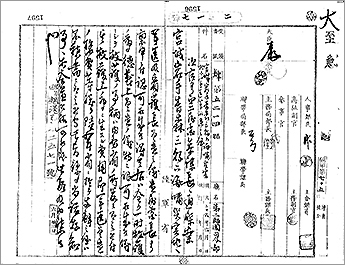 The documents, shown to the right, indicate that other places were also studied by the Japanese army for training, notably Hachioji and a space at the foot of Mt. Fuji. The current site in Sagamihara City was selected as a base camp due to its ease to secure. 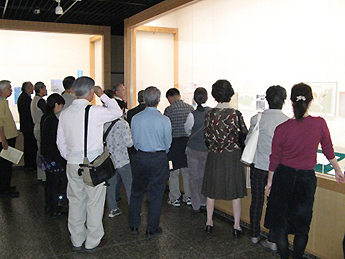 This exhibition was held from October, 2014 till the end of March, 2015 and enjoyed a large attendance and the special section pertaining to the military-base city of Sagamihara was particularly well received. Other topics of attention were the construction of Yokosuka’s naval port, the relation between Atsugi Camp and local people, and the Kanagawa prefectural government’s efforts to ease negative effects caused by the bases. These topics were introduced through public documents and administrative publications. The European Association of Japanese Resource Specialists (EAJRS) is a society of resource experts affiliated with research institutes as well as universities, public libraries, and organizations providing database resources on Japan. While members mainly reside in Europe, some participants are from North America and elsewhere. In general, an annual conference is held every September, at which time participants present and exchange information. For several years JACAR staff members have exhibited at the conference to get the word out about our services. In the past three years we have increased our activities by holding a workshop and exhibition booth at the conference. 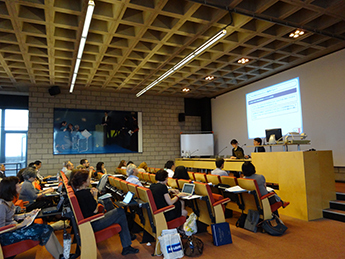 Most recently, we participated in a four day gathering from September 17th to the 20th at Katholieke Universiteit Leuven in Belgium along with a total of 78 participants. At this year’s annual EAJRS conference, JACAR researcher Muneaki Hirano held a session with Yasuyo Ohtsuka, curator of the British Library (BL) Japanese Section. The two discussed a special web exhibition co-produced JACAR and BL titled "The Sino-Japanese War of 1894-1895: as seen in prints and archives" (released May 2014 in English and Japanese). In the session Hirano and Ohtsuka examined the circumstances of their transnational collaboration between two institutions and how it all started with participation in the EAJRS conferences. They also discussed how they strived to preserve neutrality in their exhibition while translating and transliterating Japanese and Chinese into English. Here are some of the larger problems with the project (→PowerPoint data of this presentation is available on the EAJRS website). Many participants seemed to be surprised during the presentation by Japanese and Chinese Qing dynasty propaganda, but participants were also interested in efforts of JACAR and BL to present prints neutrally. One of the participants expressed a desire to exchange ideas on this matter, as he had been tackling the issue of neutrality for a long time. An essay based on this presentation is published on Current Awareness Portal (→Current Awareness Portal, E1630e). Also JACAR held a three hour workshop during the conference again this year and many people joined in. After receiving a request from a participant, the workshop introduced the special web exhibition "The Sino-Japanese War of 1894-1895: as seen in prints and archives". Moreover, JACAR showed diplomatic documents on the conference venue, the central library of Katholieke Universiteit Leuven. The library had been destroyed by a German bombardment in the First World War, and then its reconstruction was supported by the join efforts of major Japanese university presidents in their joint names. In the conference session JACAR emphasized a desire to work on more cooperative projects with other institutions, and some participants showed their intention to find a way to coordinate with JACAR. Held presentation at an international forum held by the State Archives of Turkey. Held duscussions about archival matters with staff at the State Archives of Turkey and received a tour of their facilities. Held booth exhibition at Association for Asian studies (AAS) annual conference 2015. Attemded the reception of the American Association of Teachers of Japanese (AATJ) . Held booth exhibition at the Association for Asian Studies (AAS). Visited the University of Chicago as well as Northwestern University. At the universities, met with professors, librarians, archivists, and digitization specialists to learn about their facilities as well as efforts at document preservation. This past September JACAR staff members Hiroko Matsuo and Muneaki Hirano visited two of Britain’s Imperial War Museums (IWM London and IWM Duxford) as well as The National Archives (TNA). At these sites, interviews were conducted about available archives and digitization of materials. Results of the interviews are outlined below. The IWM is a British national institution sponsored by the Department for Culture, Media and Sport. It was founded in 1917 during the First World War, and has collected war records of the UK and Commonwealth that span to the present day. 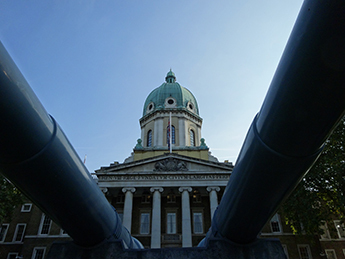 Since the 1970s, four museums have joined the IWM, and at present the IWM consists of five institutions (IWM London, IWM Duxford, IWM North, Churchill War Rooms, and HMS Belfast). The museums are run with financial support from the government and the general public. The IWM London’s collection is eclectic and includes paper documents, publications, photographs, video, audio, digitized materials, wartime paintings, tanks, and even fighter planes. The museums also, to convey the reality of war to a wide range of people, organize ad-hoc exhibitions with special themes as well as exhibitions from the permanent collections. In 2014, to commemorate a hundred years passing since the end of WW1, new First World War Galleries opened. 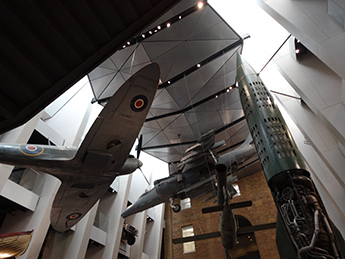 At these galleries and others, IWM London receives more than one million visitors every year. IWM Duxford was constructed to be an air base for the UK Air Force during WW1 and it joined the IWM in 1977. It exhibits fighter jets, vehicles, artillery, and even convenes air shows. The documents held by IWM that are related to WW2 are classified into two categories: "British Private Papers" (which are mostly kept at IWM London) and "Foreign Documents" (which are held at IWM Duxford). "British Private Papers" include documents related to former POW and civilian internees whom were held in Japanese captivity in 1939 to 1945. Those documents include personal records such as diaries, letters, and memos. Many of the items were acquired from private donors and if the donors wished to keep their originals, the museum possesses copies. In most cases, individuals retain copyrights when relevant and there are limitations for museum use; most of the collections are accessible to the public at IWM London. "Foreign Documents" include official British records of the International Military Tribunal for the Far East (Tokyo), the "Japanese AL" collection of Japanese military documents on WW2, and a collection of Anglo-US intelligence reports on the Japanese war economy. Two important collections are the Japanese AL Collection and the Collection of Anglo-US Intelligence Reports on War Economy. The Japanese AL Collection contains mostly Japanese monographs on WW2 military operations written by former Japanese military personnel who served at the 1st and 2nd Demobilization Bureau after the war. Some of documents were translated into English and were shared among allied forces. The documents preserved at IWM Duxford have been classed as British public records and transferred from UK government agencies, such as the Cabinet Office Historical Section and the Foreign Office. The records have been useful for military evaluation, education, and for writing British Official War Histories. Items transferred to the archives are accessible for the public. The Collection of Anglo-US intelligence Reports on War Economy are items researched by Anglo-US intelligence agencies on Japanese wartime society, economics, and military technology among other matters. These reports include "Training in Chemical Wars by Japanese Air Forces", "Water System in Gifu", "Furukawa Industry Company", "Food Supply in Japan", and "Activities of Japanese Military Intelligence Agencies in Europe". 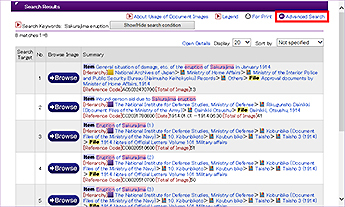 IWM London has a section specialized in digitizing items. Due to limits in budget, priority is given to digitization of certain projects; currently items related to WW1 are given high priority. The IWM also offers paid digitization services for researchers, in which cases copyright ownership must be proven when applicable. All digitized content is added to the digital holdings of the museum and can be made, with permission, open to the public assuming there are no issues with copyrights. The National Archives is an executive government agency of the Ministry of Justice. Between 2003 and 2006 the UK's National Archives absorbed four government bodies, the Public Record Office, the Royal Commission on Historical Manuscripts, Her Majesty's Stationery Office, and the Office of Public Sector Information. In 2011, responsibility for archives across England was transferred to The National Archives to provide advice and guidance on the preservation of public records held in other locations across the UK. 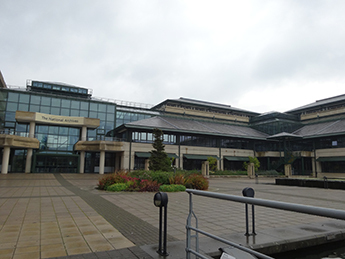 The collection of over 11 million historical government and public records held at The National Archives in Kew, is one of the largest in the world. From the Domesday Book to modern government papers and digital files, the collection includes paper and parchment, electronic records and websites, photographs, posters, maps, drawings and paintings. It takes up to 200 linear km of shelving to house the documents, accruing at 1km each year. The National Archives' collection is seen by some 100,000 to 150,000 visitors annually and web users access the website about 1.5 million times per month. All of this is carried out by around 600 staff members. As a general rule, government records that have been selected for permanent preservation are sent to The National Archives when they are thirty years old, though the government has begun its move towards releasing records when they are twenty years old. Many are also transferred earlier under the Freedom of Information Act. The National Archives' 21st-century role is to collect and secure the future of the government record, both digital and physical, to preserve it for generations to come, and to make it as accessible and available as possible. 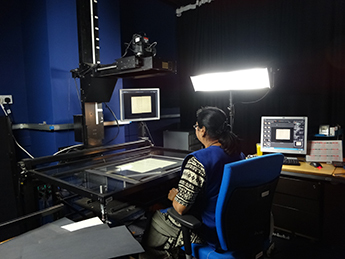 Although microfilm had previously been used for preservation, TNA has now been digitizing documents for the past decade. 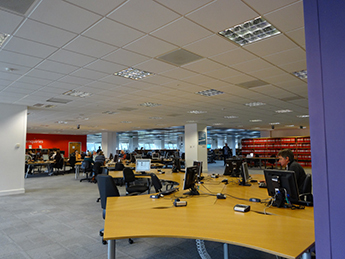 TNA houses a large space for digitization and benefits from expert employees. TNA has digitized around 100 million pages of documents, which account for only about 5% of their total paper holdings. Since the budget for digitization is limited, documents are prioritized if they are either high in commercial value, deteriorating in quality or have high demand from the public. TNA holds agreements with a private sector companies to digitize TNA documents and publish them online although TNA holds copyrights. The commercial partner funds the digitization and charges for access to the online content as way to pay for the initial investment. In order to protect their documents TNA has any third party company conduct digitization operations inside of TNA premises under their supervision. Second World War era document holdings include detailed information cards created by the Japanese military on some 45,000 individual POWs. 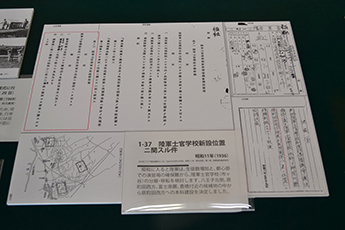 The cards were partly filled in English, so location information about where and when POWs were captured is clear but information on how they were dealt was written only in Japanese. Due to language constraints, the cards have not been researched very much and they are not catalogued or easy to understand by the public. There are also documents in the collections that were submitted to the British authorities by POWs upon arriving in the UK, which have been used as proof to claim compensation after the war. There are also records of military trials held in Asia by the Allied Forces with the UK corps. "JFK: His Life and Legacy"
Inaugurated as the 35th President of the U.S. in January 1961, John F. Kennedy (1917-1963) became the youngest person ever elected to serve in that office. President Kennedy continues to attract admiration from all over the world even after a half-century later from his tragic assassination in November, 1963. After the appointment of his daughter, Caroline B. Kennedy, as U.S. Ambassador to Japan, the country's interest in the Kennedy family continues to mount. This exhibition will feature President Kennedy's life and legacy by introducing original documents, reproductions, video images, photographs, and various mementos held at the John F. Kennedy Presidential Library and Museum in Boston, where President Kennedy was born. 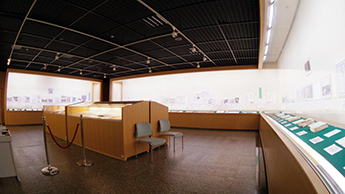 Materials deposited in the National Archives of Japan and loaned pertinent materials from other individuals and/or organizations will also be exhibited. Thank you for reading JACAR's 17th newsletter, and we hope you enjoyed it. 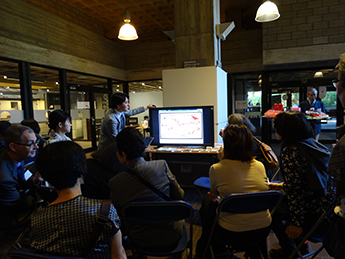 Above we have discussed how JACAR's materials were used in an exhibition at Kanagawa Prefectural Archives. We hope you also found it helpful that there has been a report given on documents in England. To make the newsletter an even more useful reference in the future, we would deeply appreciate any comments or feedback on * THIS FORM *.